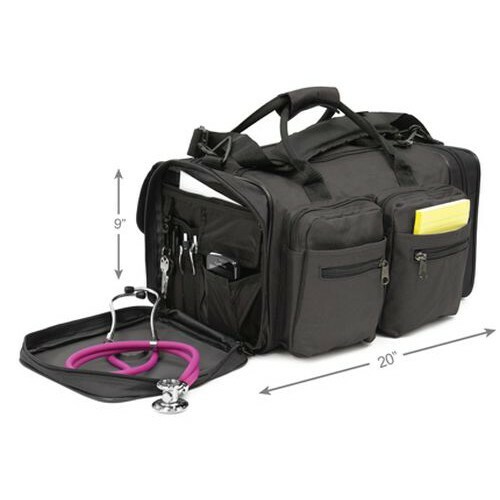 Professional Healthcare Carry All Bag, manufactured by Hopkins Medical Products, is a refined medical equipment bag that ensures HIPAA and OSHA compliance. To establish HIPAA compliance, these nursing bags feature lockable zippers that safeguard sensitive information, such as patient records. If you need additional security for peace of mind, you can also order this nursing bag with a combination lock. Equally important to HIPAA compliance is OSHA compliance. These nursing bags, furthermore, integrate a compartment to safely and securely hold a sharps container, and separate "clean" and "soiled" equipment. The Professional Healthcare Carry All Bag will always keep your contents secure, as it is reinforced and incredibly durable. 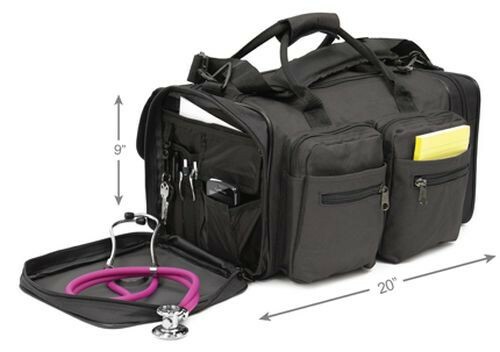 In addition to all of these great features, this medical tote is effortless to transport. Depending upon your preferences, you can adjust the deluxe padded shoulder strap for optimal comfort or use the double-handed grip. Truly, there is no better bag to entrust with safely storing your diagnostic equipment, supplies, and patient sensitive information. Order now and enhance your traveling practice today! Adjustable and removable deluxe padded shoulder strap. Available with or without a combination lock. Reinforced bottom with scuff feet. Product Numbers: 530823, 530823CA, and 530824. Medical Tote Length: 20 inches. Medical Tote Depth: 9 1/2 inches. Medical Tote Height: 9 inches.